DCist used the photo above to illustrate a story on upcoming anti-war demonstrations. 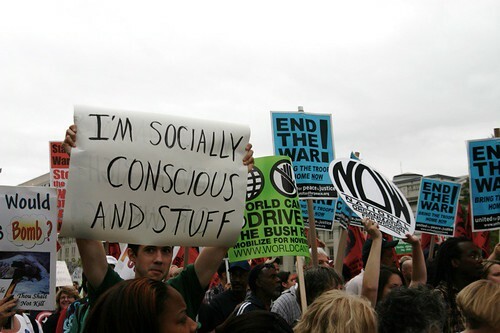 It’s from a couple years ago, during a previous anti-war march. I spied this fellow, and his nervous happiness, in the crowd. Funny – no one else seemed to notice what was actually on his sign. The important thing to the crowd, I guess, was that he was carrying a sign. Ironically, if you read the comments to the DCist story, no one else saw the words on the sign either. There’s a message here somewhere. Are protests on signs like ads that we tune out? Salman Rushdie was recently awarded a knighthood by Britain, an act which caused more than one anti-Western rant from the medieval ayotollahs of Iran and Pakistan. The usual threats of violence from the usual dark quarter of the world. This honor by Britain reminded these hateful clerics that Rushdie is the author of The Satanic Verses, a novel considered blasphemous (by some) to Islam. Rushdie has been under a sentence of death since 1989, when the book was first published and the clerics of Iran took offense. Only recently has he felt safe enough to emerge from hiding. What’s been forgotten over the years is that the hostage-taking Ayotollah Khomeini wasn’t the only one outraged by The Satanic Verses. This excellent article in the International Herald Tribune reminds us that the book was published to great controversy. Like the recent cartoon conflagration in Denmark, not everyone stood behind the right of free speech in an open society. It’s just a novel, words printed on the page, a novel that billions of people will never see or even bother reading. A novel cannot violate a religion. A basic tenet of Western civilization is the right to offend people – we must not go backwards on this. I had heard of Rushdie in 1989, after reading his book Shame in a modern literature class. The fatwa by Khomeini made The Satanic Verses a bestseller. I remember racing through book stores in DC, looking for a copy. I wanted to buy it to show my support of free speech, to show the Ayatollah that we wouldn’t be intimidated. Your religion doesn’t dictate what I can read. I couldn’t find one anywhere – it was the iPhone of its day 😉 After I got a copy from a friend who worked in the publishing industry, I started the book and found it incomprehensible, a wild magic realism narrative that I couldn’t understand. All this trouble for a book? Since then, I’ve gone on to enjoy other Rushdie novels, especially the brilliant Shalimar the Clown. Looking back, it’s tempting to believe that America and Europe supported the absolute right of free speech. However, when faced with the very real threat of violence, people don’t always live up to their ideals and seek to justify censorship. What will we do when the next of these conflicts arise? Will we stand firm or compromise our values? Reverend Billy preaches against Starbucks in Austin, TX. Reverend Billy came to the chain-ridden streets of Silver Spring to minister for our sins. What did we do wrong? Americans shop too much, according to the Reverend, with our dreams dictated by major brands and our lives enslaved by credit card debt. With this type of message, you would think that his movie, “What Would Jesus Buy” would be a humorless polemic. But what distinguishes the Reverend from the whole crop of latter-day alarmists (for example, the food police) is the humor and humanity he brings to his evangelical message. I first encountered the Reverend on the streets of Austin during SXSW. He and his joyous band led a gospel-style procession up Congress Avenue, singing out to everyone, “Stop shopping! Stop shopping!” Like the Pied Piper, he soon had a delighted throng following him, for the choir was truly rocking and the lyrics were hilarious indictments of our own materialism. He led a crowd up to a Starbucks and preached against the sins of this ubiquitous company, and for all of us to make better choices with our dollars. This humor and appeal to our better nature is on display in the new documentary, “What Would Jesus Buy.” This film, which screened at SilverDocs, follows the Reverend and his choir around the country at the height of Xmas shopping madness. Produced by Morgan Spurlock, it’s a funny and occasionally horrific look at the excesses of 21st century America. We have too much stuff and spend more than we have to buy the latest products pitched to us. Where the doc comes alive is when we see Reverend Billy and his wife, Savitri D, struggle with their mission. Are they really making a difference? The Reverend answers affirmatively, if they can just change one life. And they do, by blessing an infant outside a Target – a really touching moment. This sets up the final confrontation with the forces of the “shopacolypse” as Reverend Billy goes into the belly of the Beast (or Mouse) to spread his good news. The packed house at SilverDocs loved it, especially when the Reverend and the choir appeared in the wings and began to sing a couple of new songs. They’re trying to get distribution for the movie. Nobody likes being preached to, whether it’s religion or politics. But Reverend Billy has managed to communicate his message through humor and satire. And it’s a message that stays with you because the Reverend doesn’t try to make us feel guilty, he tries to make us good.